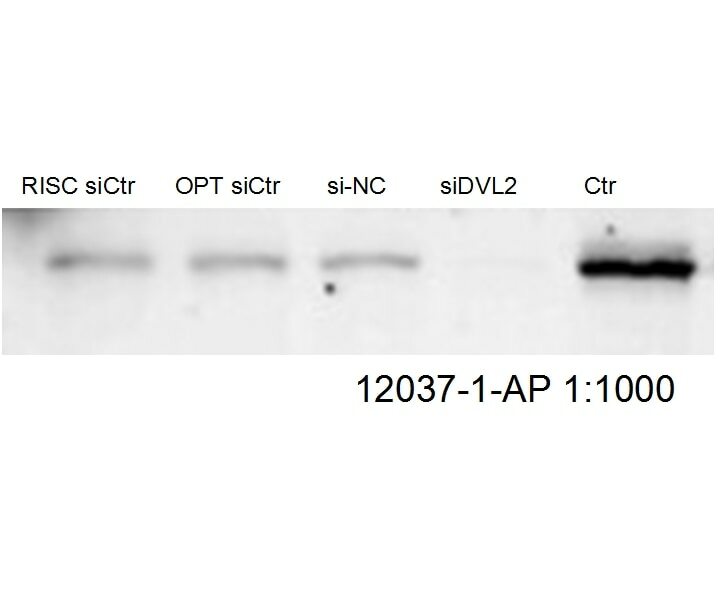 WB result of DVL2 antibody (12037-1-AP, 1:1000) with siDVL2 transfected cells. 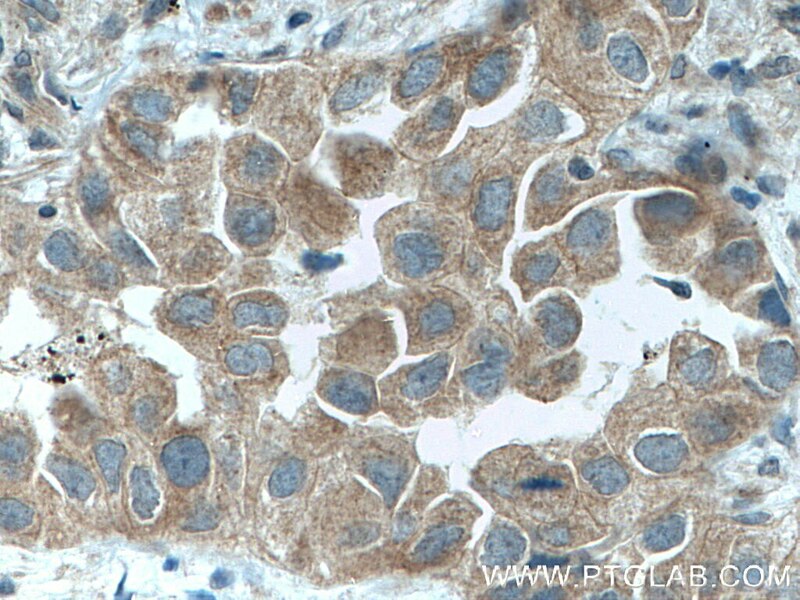 Immunohistochemical analysis of paraffin-embedded human lung cancer tissue slide using 12037-1-AP (DVL2 antibody) at dilution of 1:200 (under 10x lens) heat mediated antigen retrieved with Tris-EDTA buffer(pH9). 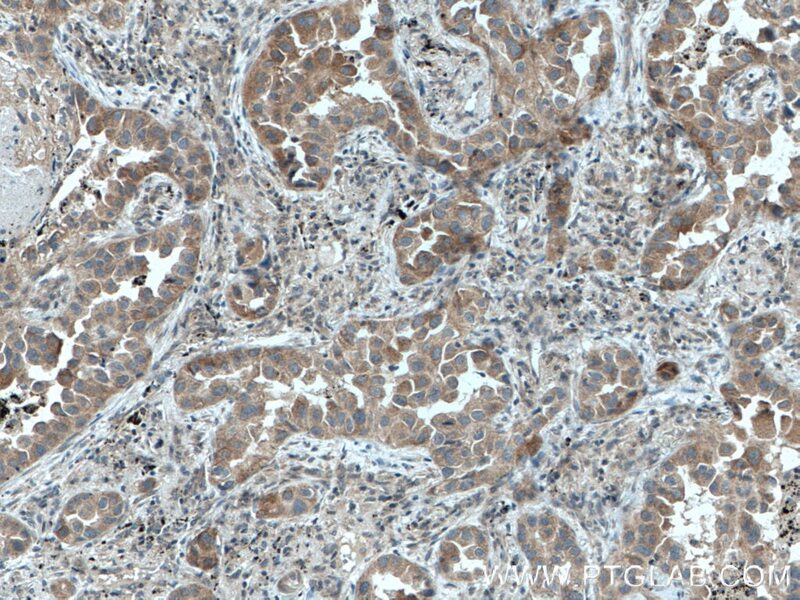 Immunohistochemical analysis of paraffin-embedded human lung cancer tissue slide using 12037-1-AP (DVL2 antibody) at dilution of 1:200 (under 40x lens) heat mediated antigen retrieved with Tris-EDTA buffer(pH9). 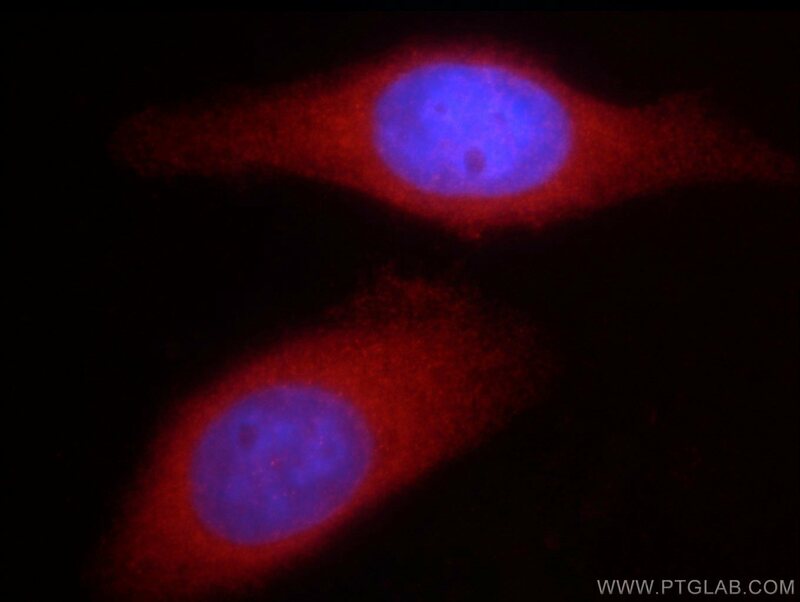 IP Result of anti-DVL2 (IP:12037-1-AP, 4ug; Detection:12037-1-AP 1:1000) with MCF-7 cells lysate 3200ug. 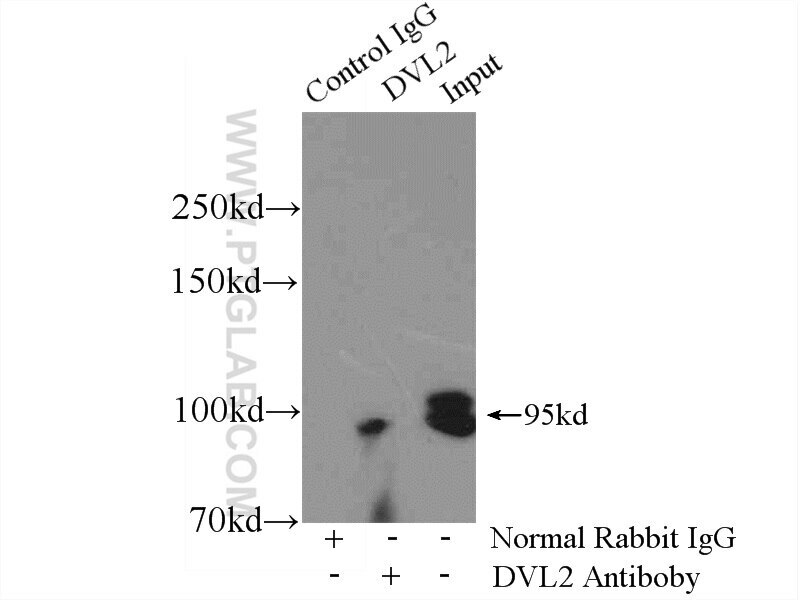 DVL2 is member of the dishevelled (dsh) protein family. DVL2 encodes a 90-kD protein that undergoes posttranslational phosphorylation to form a 95-kD cytoplasmic protein in a variety of cell lines and species. DVL2 participates in Wnt signaling by binding to the cytoplasmic C-terminus of frizzled family members and transducing the Wnt signal to down-stream effectors. It promotes internalization and degradation of frizzled proteins upon Wnt signaling. It plays a role both in canonical and non-canonical Wnt signaling. It also Plays a role in the signal transduction pathways mediated by multiple Wnt genes. Distinct functionality of Dishevelled isoforms on Ca2+/Calmodulin dependent protein kinase 2 (CamKII) in Xenopus gastrulation. The phosphatase Pgam5 antagonizes Wnt/β-Catenin signaling in embryonic anterior-posterior axis patterning. Paternal nicotine exposure defines different behavior in subsequent generation via hyper-methylation of mmu-miR-15b. Protective effect of autophagy in neural ischemia and hypoxia: Negative regulation of the Wnt/β-catenin pathway. Characterization of potential TRPP2 regulating proteins in early Xenopus embryos.